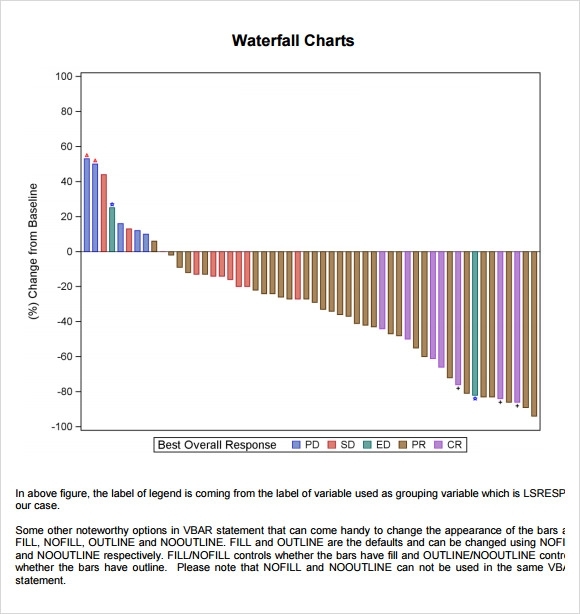 Waterfall charts are a creative and fun way to analyze data and plot statistics. Our waterfall chart templates are particularly popular amongst production companies, service providers and several others. Available in Word and Excel formats, these templates are absolutely free of cost. They can be downloaded quickly and easily in a variety of fun and vibrant colors. The templates can also be printed in black and white or color as per the Waterfall Chart Templates requirements and needs. The bottom and side margins of the chart permit you to fill in relevant and important data and information for you to analyze and study. 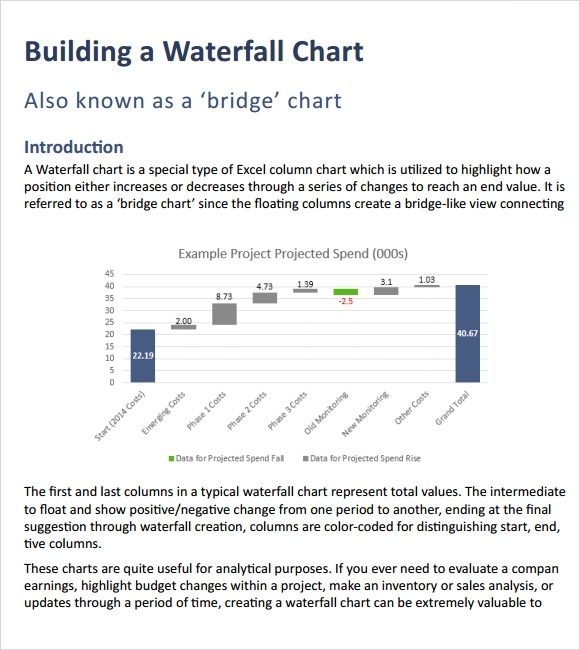 This is a professionally designed PDF template for waterfall chart. It is a good tool to analyze the position of figures in an organization like earning, expenses etc in a simple chart form. The template also contains the excel table which will allow you to put the relevant values in it and it will show them in waterfall chart form. This is yet another good waterfall chart template. This template is very good if you want to analyze the value of data as compared to the base line assigned for each. This template will give the clear picture of growth or descend of the figures. There are different colors of bars in this template to denote different values for them. This is a one-page report template with waterfall chart for the organization. The template contains the waterfall chart for the values of data and has explanation for each value. This is the best way to present the report in organizations to the higher authorities. 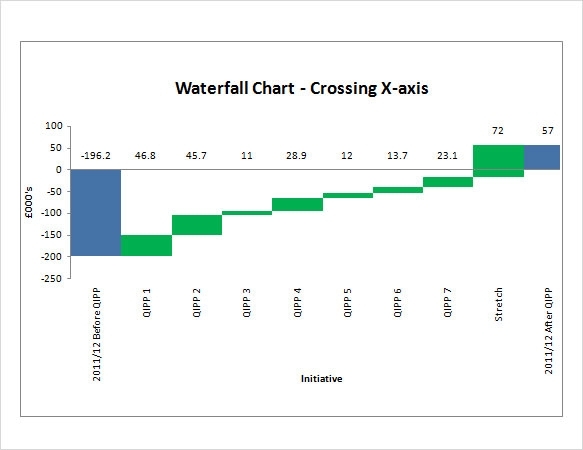 If you looking for a good template for waterfall chart then you can download it from here. 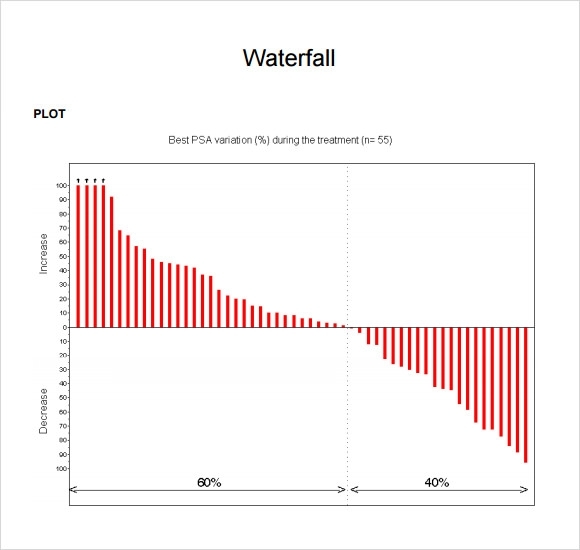 This one is yet another good template for making the waterfall chart. The template is designed in excel format, therefore it is easy to use it. All you need to do it that just download this free template from here and put the values of different data in the given cells. This will automatically populate the waterfall chart for those values. 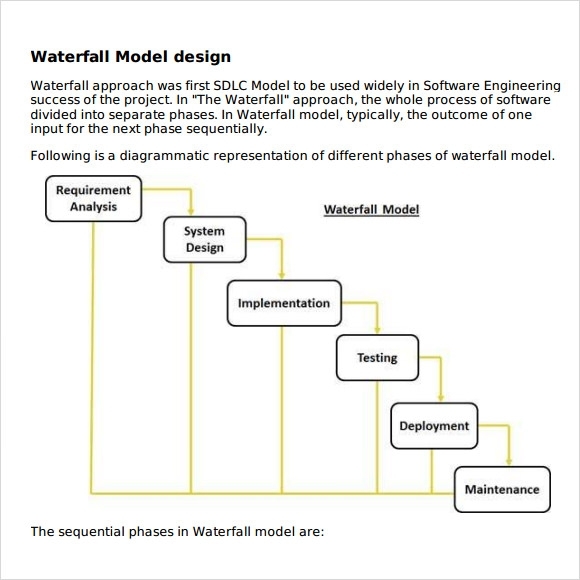 Why We Need Waterfall Chart Template? Waterfall charts are the best way to display the position of different statistical values of the company in a single chart. This format allows the stakeholders or organization to review and discuss the position of business. They can take corrective actions for specific sector of the organization with the help of this chart. Template given here are some of the best example for the waterfall chart and if you are preparing a report and looking for good template for waterfall template then you may download any of the above template and use it for your report. These entire sample templates are free to download. When We Need Waterfall Chart Templates? Stakeholders in organizations required these charts for monthly, quarterly and yearly report of the different statistical values of the company. Executives who are preparing the report for the company and looking for the good template to present the data in factual yet simple format then they also need these templates to make the report. How These Waterfall Report Templates Will Help You? Reporting the position of multiple verticals of the company in simple yet effective format is not an easy task there are many types of formats are available to perform that task. However, the waterfall reports the best medium to represent the statistical data in an effective manner. These sample templates are available for free download and if you are professional and looking for some good templates to make a waterfall chart report, then you can choose from the sample template given above. These template are designed by professionals and are very good for the making the waterfall chart report of any statistical data. A good business template is always required to represent statistical data in a precise manner. 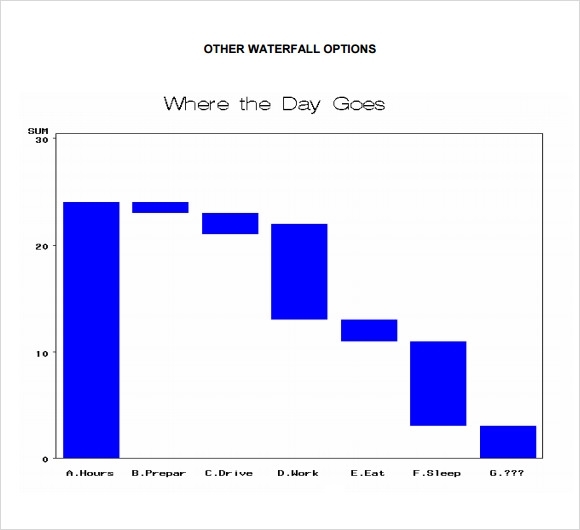 Templates given above are the best sample for waterfall chart making and are available for free download. 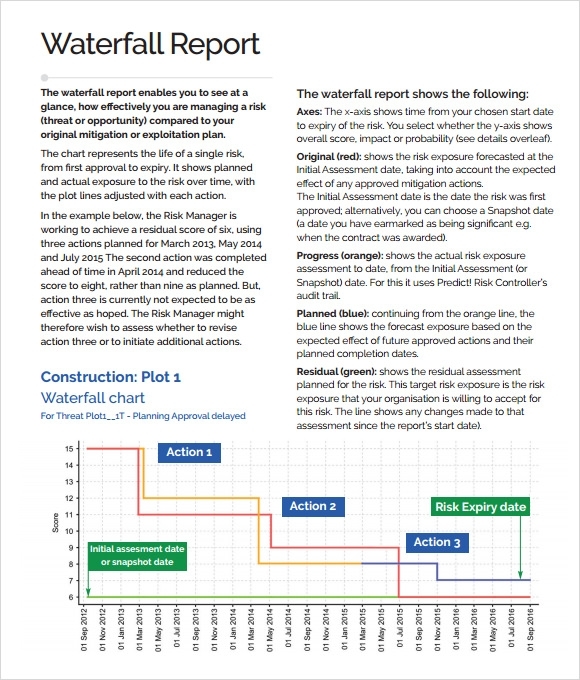 All you need is to choose the right template for you and download it to make the waterfall report for your organization.